How Does A Crypto Analyst Makes A Mistake And Still Make Over 265% Profit? Ryan Wilday is our newest analyst. When we found him, he had already been trading over two decades for a supplemental income, but without the Elliott Wave Theory. He was a quick study in the theory and soon was producing professionally accurate wave counts, according to our method- Fibonacci Pinball. Ryan was also an early adopter of cryptocurrency and trading the new asset class. His life started to change in August 2017 when I brought him on staff at ElliottWave Trader to lead our cryptocurrency analysis team. For the first few months, his new life was very quiet publicly, until he made a very timely call. In mid-October 2017, he made a call for STEEM, the currency of the Steemit social media site, to reach $5, perhaps by January 2018. The price at the time of his post was 92 cents. A couple of guys from England — the hosts of the CryptoNights videoblog on Steemit — saw the post and interviewed him. This is where his work first came to public attention. While he’ll admit his timing was intuitive, he stood by the price target, which was an important Fibonacci level in his ElliottWave count for STEEM. STEEM first hit $5 on January 3, 2018. It moved on, topping at $9.24, before starting the correction we now find it in. His original post is here, and you can see the CryptoNights videoblog interview here. Shortly after his STEEM prediction, he made a call that the coin Verge would see a price of $13 from $0.35 by 2018. This forecast, too, was highlighted on CryptoNights. This call jump started his first run-in with overheated sentiment as a public analyst. After the posts about Verge, his Twitter followers increased by over 300%, mostly bullish Verge holders. While the unbent bullishness should have caused him to step back, he held on to his prediction for a time. As expected, Verge soon topped. However, over the course of the ensuing correction, it broke levels of price support that he had not anticipated. Soon, he had to admit publicly that he no longer saw $13 as likely anytime soon, or even within years. In fact, he saw no more than $2 as likely. The change came about from both a price break of long-term support and the discovery of historical data that forced an adjustment to predictions. Forward projections were then lowered. While he adjusted his predictions and looked elsewhere for primary small-cap holdings, the Verge community clung to their bullishness, despite his adjustment. He continued to get peppered with requests for updates on the price. While he remains bullish long term, his now-tempered, yet still bullish, predictions were greeted with hopes he was incorrect. In late March, news broke of a partnership between the Verge team and a large internet transactor. In the words of the lead developer, this partnership could make Verge a top 3 crypto. And, while Verge seems to have put in some sort of bottom on March 18, the price structure had not been sound for a lasting bottom. But the bullishness of the Verge holders continued to grow in the face of poor price action. Ryan’s updated view, of course, remained unchanged. The morning of the announcement, April 17, Ryan held a special live webinar for his subscribers. He opened the webinar 15 minutes before the announcement. During that pre-announcement time, he discussed the entire price history of Verge, and how it projected a possible local top. Then he focused on how, off the March 18 low, the action was not clearly bullish and definitely not impulsive. We had already seen a small correction show before the announcement and he explained that more was likely to follow. He was right. As soon as the news broke, Verge fell hard. It saw a drop of nearly 50% from the pre-announcement high and has not backtracked to this day. The price remains flat, and potential remains for a further 50% decline. You can see a video of that webinar here. The partnership announced was with PornHub. Verge coin was going to be integrated into one of the largest adult entertainment franchises on the web, offering its users payment privacy in the process. Can we blame the price fall on disappointment in the announcement? Perhaps, for some, this could be true on moral grounds, but regardless, this is probably one of the largest partnerships in the crypto market, financially speaking. Since then, we’ve seen another partnership emerge. TokenPay, which already integrates Verge, cut a deal with a major German bank to create debit cards for various cryptos, including Verge. According to TokenPay, the deal was signed April 26. Yet the price remains flat to bearish despite such great fundamental news. But, amazingly, even though Ryan had to adjust his forward guidance, he and his followers were still able to stop out with an impressive gain of 265% on that one trade. We see sentiment as the pre-eminent driver of these coins. The Verge community has been one of the most bullish communities in the whole crypto market. Based on an anecdotal read of sentiment on Twitter, they have faith in deep corrections and constantly talk of moon targets, even in the face of weak price action. If most potential Verge holders have a full position, who is going to buy more to push it higher? Markets need new money to push higher, or they must come down to find buyers. Verge has been seeking lower ground, despite bullish news. Market technicians, including ElliottWave practitioners, know that markets climb walls of worry, not euphoria. Euphoria is the emotion at the top, not the bottom, of a price range. Clearly, we need some of the Verge community to turn bearish on their beloved coin for a rally to follow. For that to happen, we see two paths. If we view the price action into the April 17th high as a diagonal, we need only a .618 retrace to start to wash out sentiment. 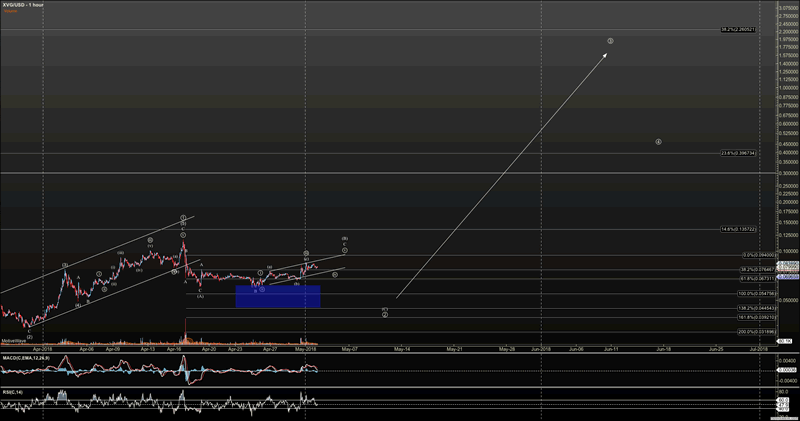 This is the Wave 2 retrace that always comes before a Wave 3 rally. Wave 3s are the largest, and usually the fastest, rallies you see in all assets. Chart of possible Verge path if .043 holds. 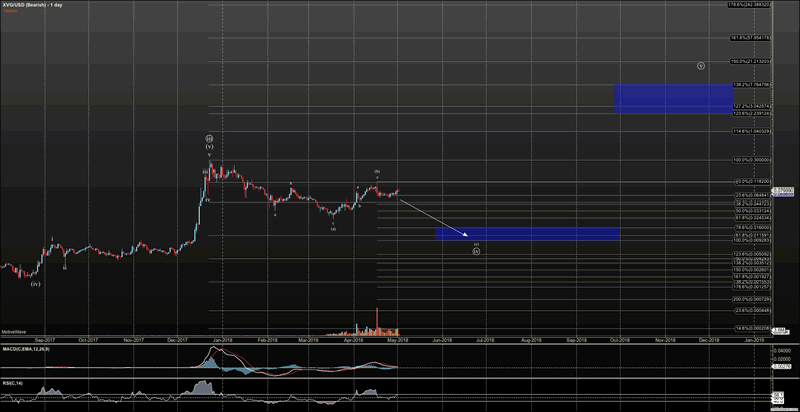 However, if support doesn’t hold for that Wave 2, which is defined by a break of $.043-$.044, we can see much lower. The next level we’d see is the $.009 to $.015 level. On our daily count, this level would be a deeper Wave 4. We would be surprised if $.015 doesn’t truly bring gloom and angst to Verge holders. This is a 98% drop from its all-time high! Zoomed-out view for the likely path if support breaks. In conclusion, be wary of the bullish crowd in any asset that excites you. Most likely, the bullishness you feel is already priced in, particularly if you are one in a very excited crowd. Ryan certainly made that mistake earlier in his Verge views. He was not holding his view based on news, but on the chart. However, the sentiment of the crowd should have given him pause. It quickly turned on him and he had to take a more bearish view. But, not before he still banked a . . . percentage gain. We use the Elliott Wave Theory as a lens through which we view price action to help us discern market sentiment and, therefore, projected price. While we are not always right in the moment, that lens quickly allows us to course correct and put our investment and trading dollars into levels where risk-to-reward is in our favor. Or, we can cut risk when we need to. Verge has been a good trade for many of our members that have been with us since late 2017. And, we expect we will be able to profit from it in the future again. And, for those that may ask, we opened our Crypto service in August of 2017, when Ryan started his small cap portfolio with $50,000 and has grown it to $139,370, for a profit of 178%, whereas his large cap portfolio has grown to $114,814 from a starting point of $50,000, for a profit of 129%.